Terrorist who killed 2 in Samaria car ramming attack charged in deaths of soldiers, attempted killing of injured. 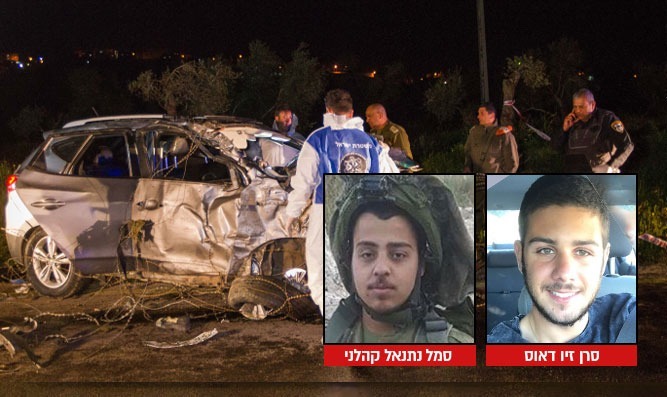 An indictment was filed Monday at the Military Court in Samaria against Alaa Qabha, the terrorist who carried out the terrorist ramming attack in northern Samaria in which Captain Ziv Deus and Sergeant Netanal Kahalani were murdered on March 16, 2018. Qabha is accused of deliberately causing the deaths (the crime parallel to the murder in Judea and Samaria) of Capt. Deus and Sergeant Kahalani. In addition, he is charged with attempting to intentionally cause the deaths (the same offense as the attempted murder) of the two other soldiers who were injured in the attack. When the indictment was filed, the Military Prosecution requested that Qabhah's detention be extended until the end of the proceedings in his case. The IDF Spokesperson's Office said, "The IDF is participating in the grief of the families and will continue to accompany them, and the IDF will continue to act to maintain security in Judea and Samaria and to bring the terrorists to justice."